Using mobile phones and handheld computers to teach basic skills could help a generation of youngsters turned off by traditional education. That is the hope of those involved in the 4.5m euro (£3m) m-learning project, an EU-backed initiative taking place in the UK, Sweden and Italy. The aim of the project is to see how mobile devices can be used to teach basic numeracy and literacy skills to young adults that have dropped out of the education system. "It is not to replace normal education but to re-engage those who have dropped out of learning and help them find out that learning is fun and can be a help in life rather than just something they are forced to do," said Jill Attewell, a co-ordinator of the m-learning project and manager at the UK's Learning and Skills Development Agency. Makers of educational materials Cambridge Training and Development have found that mobile learning has an element of privacy which can help those embarrassed by their numeracy or literacy skills. "With mobile phones you can text in answers and get instant feedback," said Jo Colley, m-learning project manager at Cambridge Training and Development. "It can be done privately and can be practised in private too." 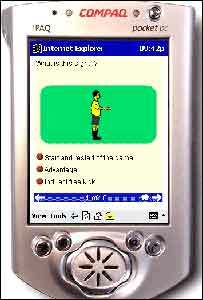 The company has also developed a range of learning materials for use on handheld computers. One is aimed at young people who are about to move house and has questions with a practical element such as how much paint will be needed to paint a room and how much it will cost. There are also learning materials for youngsters who do not speak English as their first language, such as a mock-up of how to order goods on the telephone. The m-learning project is aimed at young people aged between 16 and 24. Last year pilots were run with 35 disenfranchised learners across the UK, Sweden and Italy. This year the project plans to put 300 people through their paces. Despite the fact that mobile devices allow a private relationship between learner and teacher, the trials showed that youngsters actually prefer communal learning. "The trials showed people were enthusiastic and wanted to learn together," Ms Attewell told BBC Go Digital.